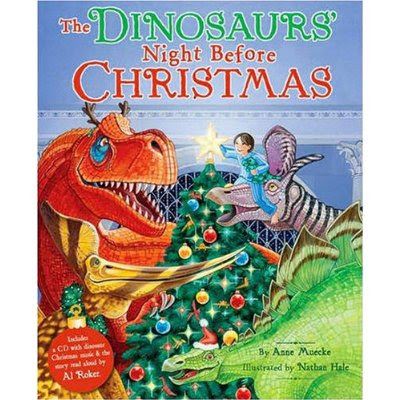 SPACE STATION NATHAN: Dinosaurs vs. Pirates: The Battle for the Night Before Christmas! Are there any pirate museums? I'm sure there are pirate museums--but not in my landlocked state. But we've got dinosaur museums like other states have WalMarts! Dinosaurs. Honestly. Without telling her that my cousin drew one of them, Emma voted and she's pretty smart. I asked her why and in her little girly voice she replied. "I like dinosaurs. I don't like Pirates." There you have it. From a girly girl. Just imagine how all our boys will vote. Amazing pics and we enjoyed the vid. Can't wait to get this new Nate Hale. We have em all. Good Job cuz! Nate! Thanks for the Christmas present. I'm a collector. Oh, and I polled my four-year-old girl. She also picked the dinosaur book from the front cover. Her reason was the blue bells. I think she means the glass balls on the Christmas tree. The love of shiny kicks in early. That cover has some good shiny stuff--I love the embossed title. Very nice. 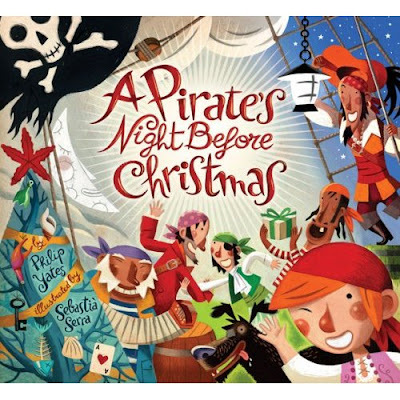 I have to admit, though, all those cute pirates on the other book cover have me thinking about writing a pirate manuscript.